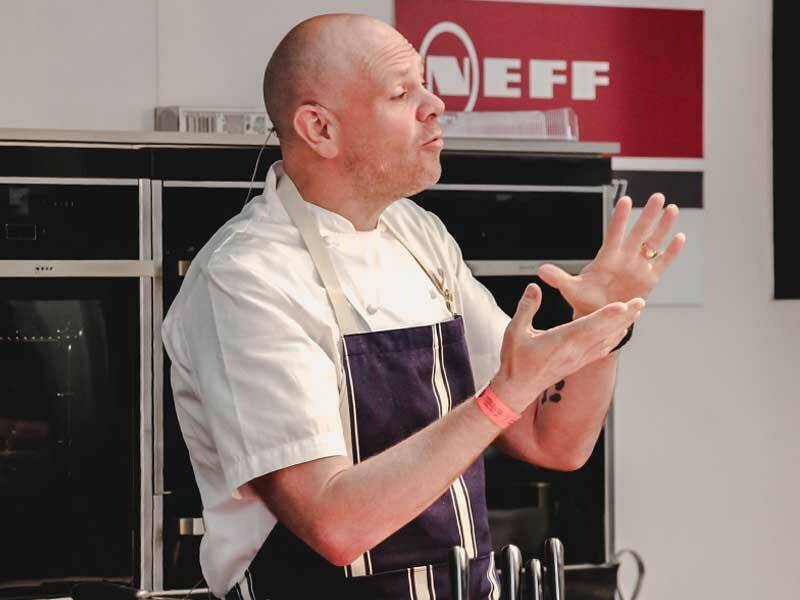 Visitors to this year’s Exeter Festival of South West Food & Drink had two opportunities to get up close to celebrated TV chef, Tom Kerridge of the award winning, Michelin starred The Hand and Flowers pub today. His packed demonstration in the Festival Cookery Theatre delighted crowds and he also joined the BBC Radio Devon Festival Question Time panel to answer questions from visitors live alongside Michelin-starred chefs Michael Caines and Paul Ainsworth. Throughout the day drinks were flowing and the food was delicious and visitors learnt how to achieve pork pie perfection in the Westcountry Bakery Theatre, children enjoyed fun food science experiments in the Darts Farm Teepees and Susy Atkins talked Devon wines to a spell-bound audience. Tonight headline acts Bill Ding and the Skyscrapers will bring Exeter Castle Courtyard alive with fantastic support from Roger Styles and Alex Dobson at the After Dark Party. Visitors can enjoy another day of foodie fun at the Exeter Food Festival tomorrow, Bank Holiday Monday. Tickets are available on the gate.